When complete, the expanded Walgreens DC will be larger than one million square feet. TOLEDO, OHIO – Construction is underway on an $82 million expansion of a Walgreens warehouse and distribution centre in Perrysburg Township, Ohio. 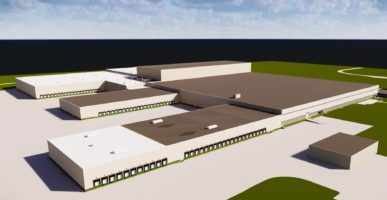 Edwardsville, Illinois-based Contegra Construction is targeting summer 2019 completion for the 380,000-square-foot expansion which is projected to create 350 jobs. Contegra will be building the addition without disrupting operations in the existing 650,000-square-foot distribution facility which employs approximate 680 workers. When the expansion is completed, the facility will total more than one million square feet and allow Walgreens to continue supplying its existing stores and additional stores it acquired from Rite Aid. The warehouse expansion is being constructed of tilt-up concrete panels and will feature 40-foot and 50-foot clear height warehouse spaces, 40 new dock doors, structural warehouse slabs, an automated storage and receiving system, pick modules, static racking, and conveyors. It will be fully climate controlled, lit with LED lighting and include break room and office spaces. Contegra has constructed more than 30 projects for Walgreens in 13 states.